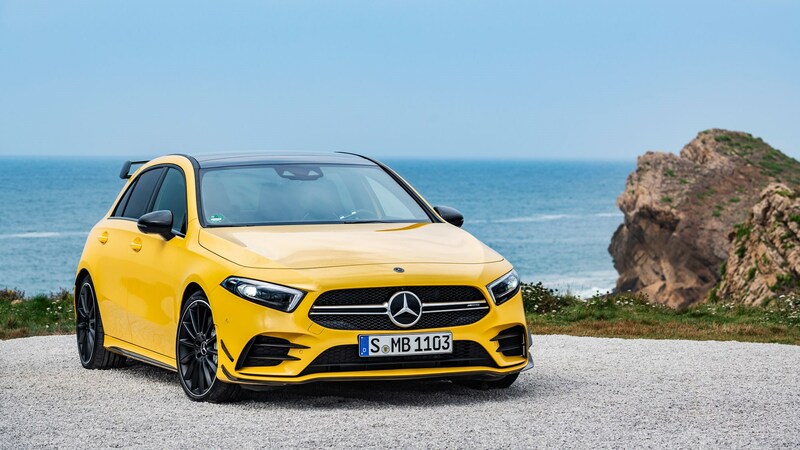 Alongside the new A35 hot hatch announced in 2018, Mercedes-AMG has just confirmed a new A35 Saloon. The hatch will cost you £35,580, with pricing for the Saloon version yet to be announced. 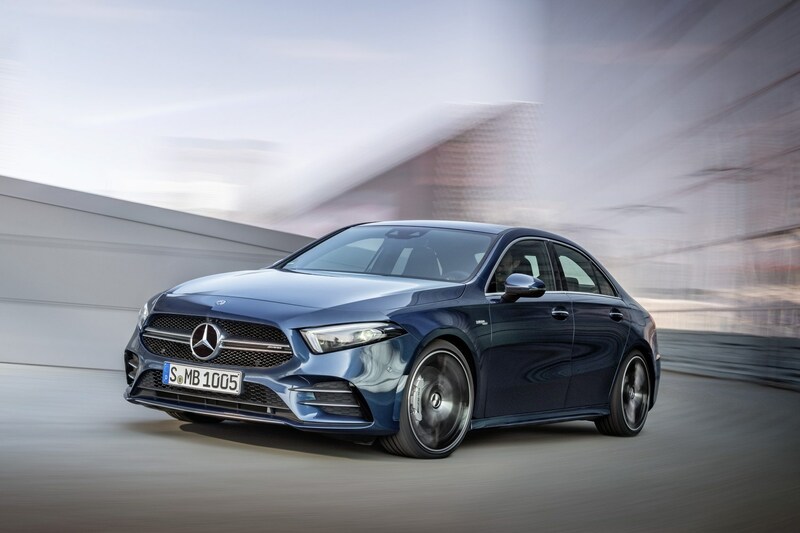 The regular Mercedes A-Class family was released earlier in 2018, and right on cue the hotter A35 AMG version of the tech-infused hatchback made its debut at the Paris motor show in October 2018. 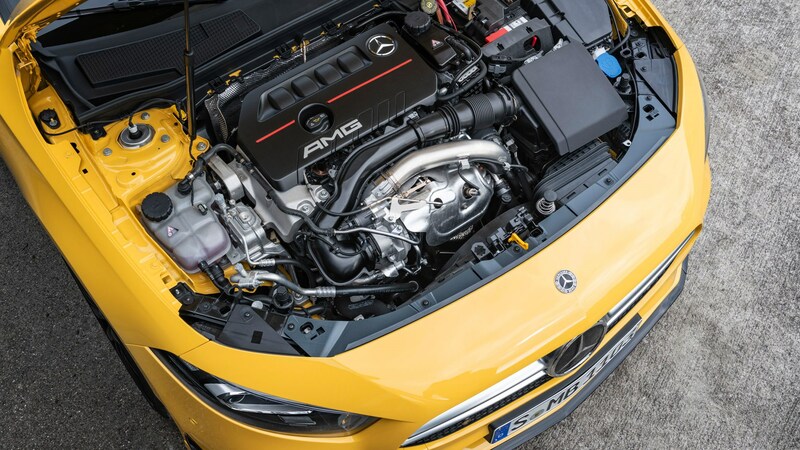 Featuring a 2.0-litre four-cylinder powerplant with forced induction, the Affalterbach-fettled A-Class will push out 302bhp and 295lb ft of torque through Benz’s 4Matic four-wheel drive system. Popping a firecracker four-cylinder turbo into the A35 means a sub-five second 0-60mph time of just 4.7 seconds – that’s over a second quicker than our Civic Type R long-termer, and the same as a current Focus RS. 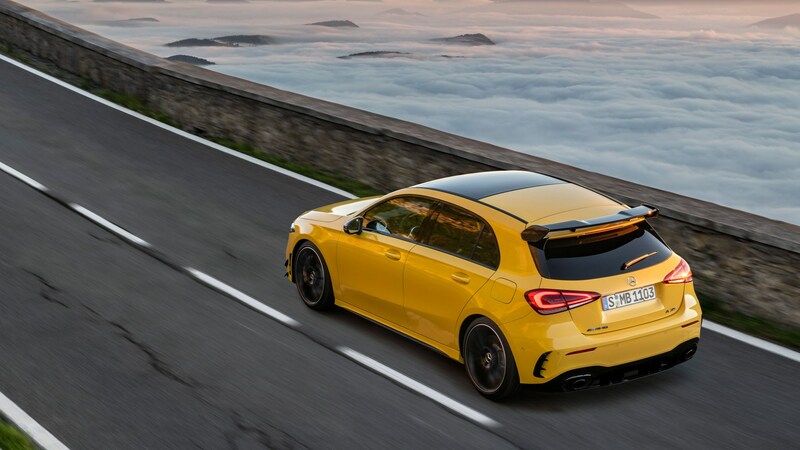 This is the halfway house AMG model; expect a full-fat A45 model to follow suit. Daimler is slowly but surely doubling its performance range, with 53 models alongside 63s higher up the showroom ladder. The smaller cars will now follow the 35 and 45 route. 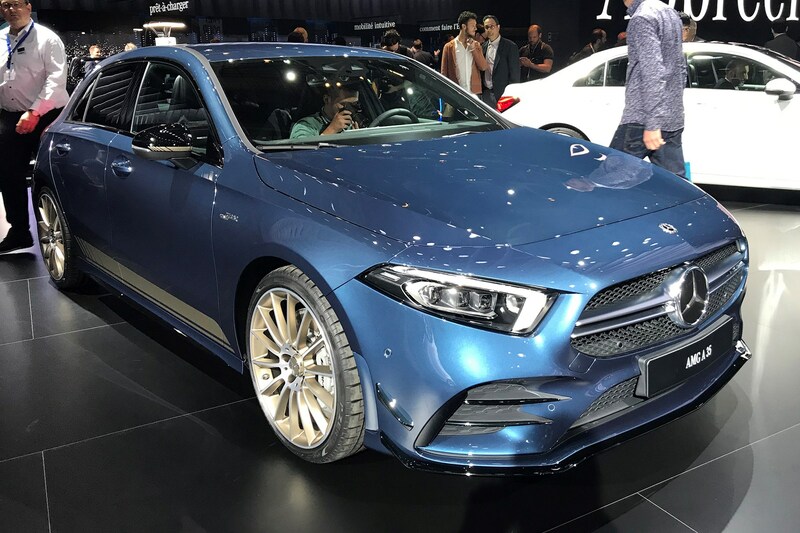 ‘With the new A35, we are fulfilling our brand promise of driving performance in every detail and offering thrilling lateral dynamics at the level of today’s A 45,’ said Tobias Moers, CEO of Mercedes-AMG at the Paris motor show (above). The new A35 hot hatch uses the current A-Class as a base, but adds some eye-catching aerodynamic furniture. That means a few extra skirts on the front and rear bumpers, some DTM-style fins on the car’s front corners – and a rather large wing and diffuser affixed to the rear end. UK buyers can pick the optional AMG Style package for £2595. This includes the AMG Aerodynamics package with a rear wing in high-gloss black, a rear diffuser in high-gloss black, front apron with larger splitter and additional flics in high-gloss black - as well as the AMG Night package, 19-inch AMG multi-spoke alloy wheels and heat-insulating dark-tinted glass. The full gangsta spec, in other words. 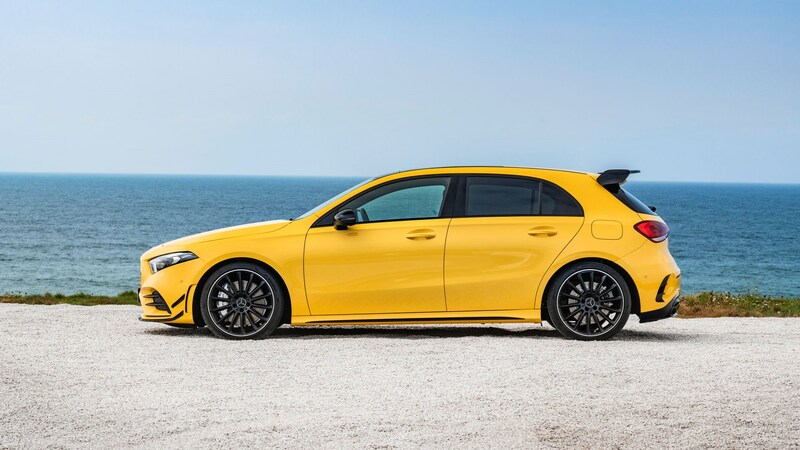 Round the front, double louvres help mark out the A35 as an AMG special – and the whole thing will sit on purposeful 18-inch twin-spoke alloys. 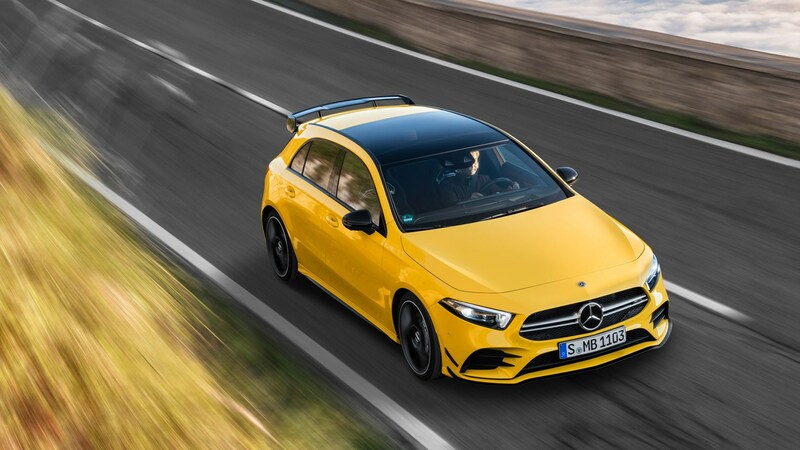 Alongside the extra aero, AMG has also stiffened the already solid front end of the A-Class hatchback to increase turn-in capability: you’ll find two diagonal braces and a shear panel toward the front of the car to give the car a little more poise. 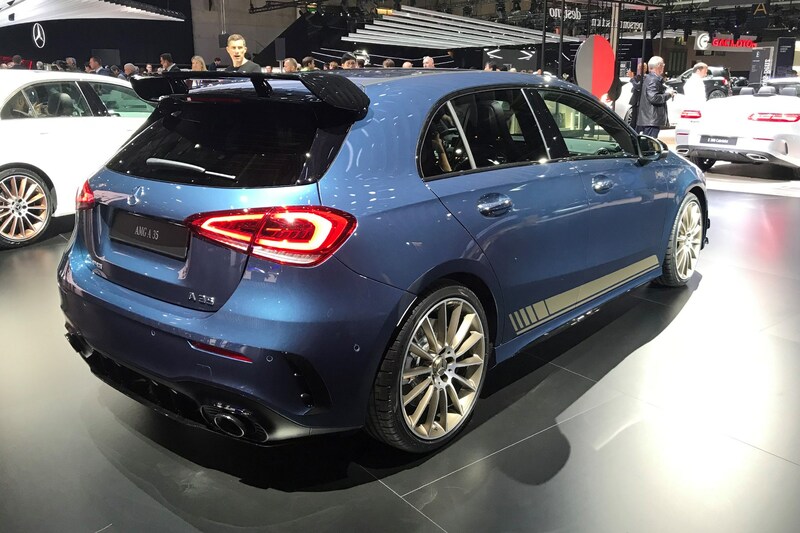 The A35 uses a MacPherson strut suspension at the front, and AMG claims trick front-axle geometry should reduce shimmies through the steering wheel under full power – just like the Honda Civic Type R. The rear end uses a four-link rear axle, and the same bearings as the A45 4Matic. Steering is taken care of by a speed-sensitive variable rack, and depending on the modes you’re in – which we’ll get to later – it’ll be heavier or lighter in assistance. AMG has added four-piston monoblock callipers and 350mm brake discs to stop the thing. The A35 gets its power from a fire-breathing 2.0-litre four-cylinder block, with a turbo stuck on the side – but no EQ hybrid help in this instance. 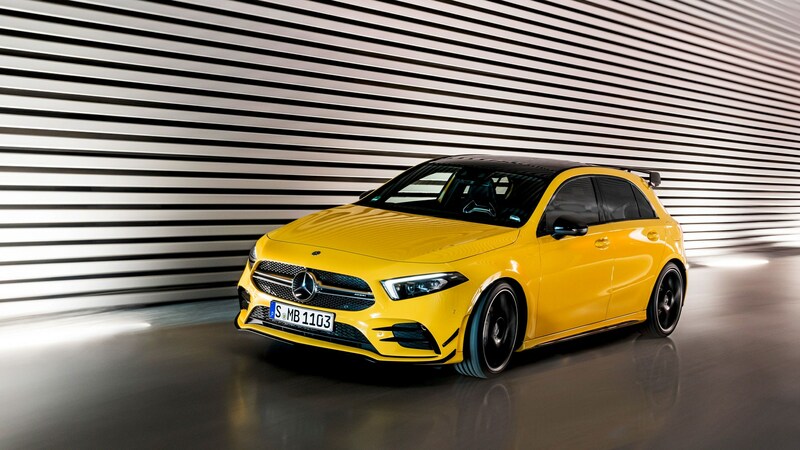 The hottest A-Class of this generation uses a twin-scroll turbo, and Mercedes says each scroll will be fed by two cylinders each for extra efficiency. Mercedes’ Camtronic tech and conical cylinder housings reduce friction, too. They've paired it to a seven-speed DCT twin-clutch 'box, and a sports exhuast system means it should sound good. 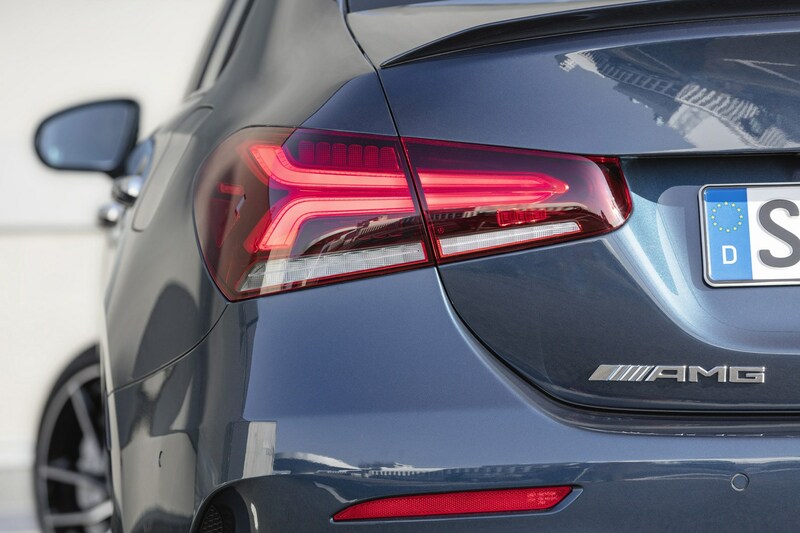 The 0-60mph sprint is rated at 4.7 seconds while there's a limited top speed of 155mph. Slippery: a new driver mode! 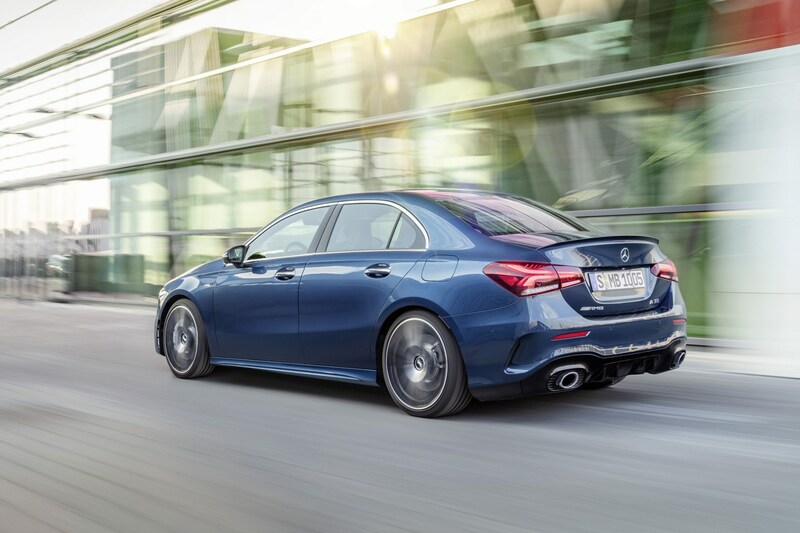 Like other AMG models, you’ll be able to dial up the performance depending on how you’re feeling: there’s Slippery, Comfort, Sport and Sport+ modes to choose from. As you’d expect, Sport+ features double-declutching on downshifts, and a partial cylinder cut-off for that on-trend ‘serious chest-infection’ exhaust bark. There’s no Eco stop/start mode in Sport+, whereas Comfort mode will give you smoothing early shifts and that eco-friendly engine-cut off when the car is stationary. 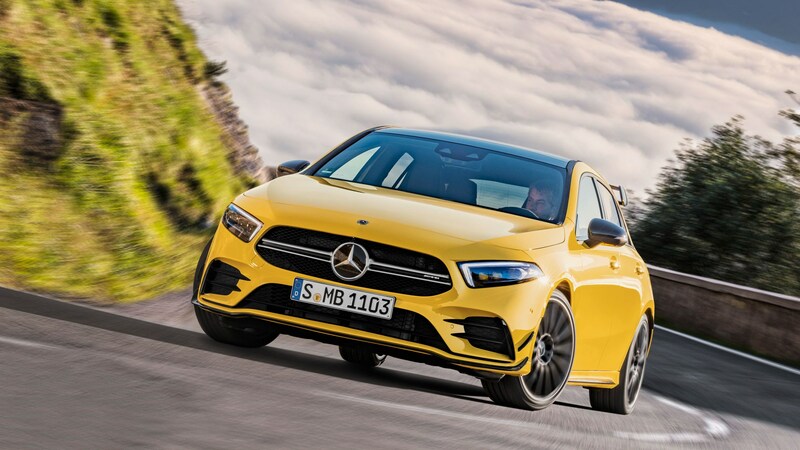 The other modes will do exactly what they usually do in an AMG car, but the Slippery mode is new for the A35 and will give you a flattened torque curve in low-grip conditions. AMG says the A35 can switch from fully front-wheel drive to 50:50 power distribution, but that means no drift mode or RWD antics. A multi-disc clutch in the rear axle does the switching, and it’ll change depending on which driving mode you’ve selected. Inside, the A35 is pretty much an A-Class with extra buttons for the car’s various driving modes – and a choice of sportier eye-catching interior themes. The standard car’s huge double touchscreens with MBUX return, and the A35 carries all the driving assistance toys we've already seen on the regular hatch. The techfest continues on the steering wheel, because along with the infotainment controls, the A35’s wheel also features an optional Porsche-style rotary dial for toggling through the car's drive settings – and it even has a small screen. That means you can technically change the car’s characteristics from corner-to-corner, Lewis Hamilton-style. The driver cockpit remains unchanged, though there’s now an extra Supersport UI, with a dominant, central rev-counter. There’s also a track-focused AMG-Pace data-logger with 3D circuit maps available as an option, though that’s 100% not coming to British shores – blame Brexit, or something. We’ll see the new A35 in person at the Paris motor show in a few weeks' time, and the car should arrive in the UK early in 2019 – but there’s no word yet on an EQ-Boost powered version. We’ll update this article with UK prices, kerbweight and more specs just as soon as we have them. 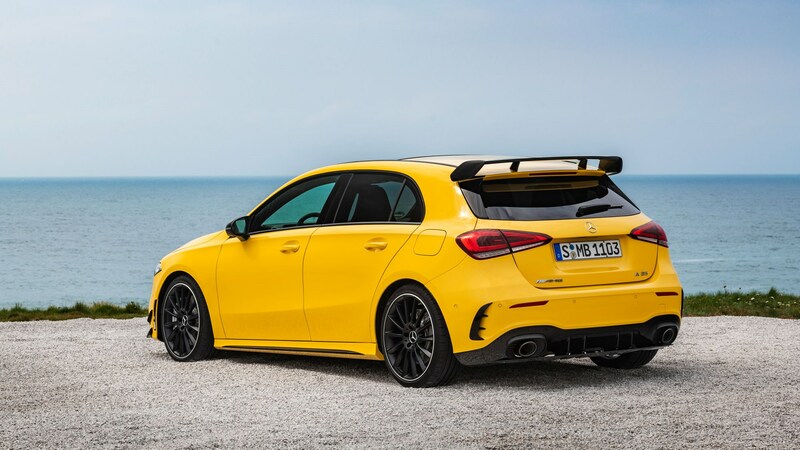 Where does that leave the Mercedes-AMG A45? He added that although the A35 is faster than the old A45 on a British B-road, next year’s car is going to be something else entirely.